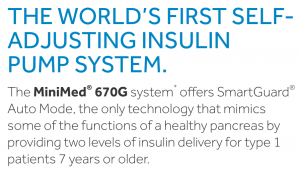 Medtronic’s 670G pump finally launched in full in Australia this week, after the Guardian3 CGM sensor it relies on received TGA approval. Medtronic is doing its usual thing and saying it’s “the first” and “the only” (see this screengrab from their website). It’s not. It is of course the first commercial system. The 670G has been used overseas for quite some time now, and so we know a lot about it. But other closed-loop systems have also been used for even longer. On various forums including this website, you will probably see many descriptions of closed-loop insulin pump systems. Usually when people write about them it’s to tout the amazing health and life benefits. And they are amazing. But you should be aware that different loop systems have different features, drawbacks, and even safety issues. The results from other loop systems are not necessarily indicative of what the 670G is able to achieve. Users need to understand that the 670G is not just a pump like any other. There are new things you’ll need to learn to use it, and new safety risks you will need to manage. Diabetes educators are apparently being trained by Medtronic with new information they need to pass on to people before they start using this pump. There are a number of issues I’m aware of from 670G users. Although I have not used the 670G myself, I have used the 640G that shares some underlying architecture. In “manual mode” the pump is a traditional pump, with configurations of a basal profile, insulin-to-carb and insulin sensitivity ratios, and target BG level. You can set temporary basal rates as usual. When in “auto mode” the pump takes over everything. It’s a “black box” that’s learnt how your body has behaved in recent history (including in manual mode). The 670G does not provide the user the freedom to customise their BG target level in auto mode. It automatically targets a level that Medtronic chose as something that will provide a “reasonable” result for the average person. This level is a fair bit higher than many users would target themselves. People who exercise a lot will miss the ability to configure temporary targets appropriate for the exercise they’re doing. One of the few configurations you can make in auto mode is the duration of insulin action (DIA). In an attempt to force the system to dose more aggressively, some people have fudged the DIA to shorter times. However this can cause significant safety issues with hypo risks when in manual mode, as the pump’s calculations of insulin-on-board (IOB) can cause boluses to be too large as it will assume the insulin has been used up. This fudging can lead to nasty results! For a technical discussion of DIA issues (not specifically relating to the 670G) see this article at Diabettech. Auto mode can stop at various times due to many different alarm conditions. This can include the CGM not being calibrated recently (which is “great” when it happens while you’re sleeping). If you’re having a “sick day” and are fighting an infection (or have had to use steroids) it’s normal for your glucose levels to ride higher (and need more insulin to bring it down: your insulin sensitivity tends to go up rapidly). Even if your CGM is working, if the 670G has been spending a few hours fighting to bring your BG down and it’s not responding as the system expects, it will alarm and drop out of auto mode as a “safe” decision. Personally I would prefer the system to keep working to control things with all its safety measures still in place! Many users have summarised the 670G as doing a reasonable job at keeping you in range and avoiding hypos when everything’s behaving. But once your levels go high, manual intervention is usually required. Sometimes the system refuses to allow the required correction boluses, and you have to disable the protection altogether and switch to manual mode to try to bring your system back into range and then when things have stabilised try to re-enable auto mode. Of course then we run the usual risks of “rage boluses”, and until you can re-enable the automatic protections those risks are all too real. 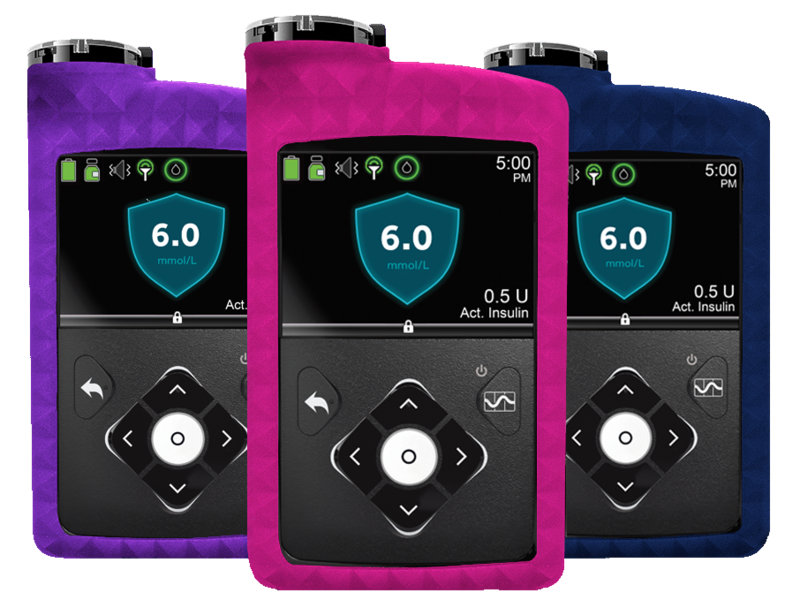 When the pump drops out of auto mode it disables SmartGuard, which means that in manual mode it will not be providing the protection of low-glucose suspend until you re-enable SmartGuard. Many 670G users have run into severe hypo issues because they forgot (or didn’t realise) this detail. Overall the 670G (like the 640G before it) is a system that will give many alerts. You can disable some of them as they’re just annoying, but most of them will need your attention to bring the system back into line and keep auto mode running. Pay attention to the alerts: don’t just ignore them and assume the system is protecting you! The 12-hour CGM calibration issue might seem minor to someone assessing the system who’s never had to live with a CGM, but as an experienced CGM user I can tell you that it’s a significant drawback compared to some other CGMs. And because a closed-loop system relies on the CGM data, the issues flow through to the rest of the system. Medtronic’s presentations about 670G trials have tended to boast that they have managed to achieve glucose data that remains within the target range about 70% of the time, and HbA1c results below 7%. These results are indeed more impressive than most people manage to achieve without a closed-loop system. But is it “good enough”? Consider those of us who live productive lives (without having to concentrate on our diabetes every hour) and have non-Medtronic closed-loop systems that help us achieve >95% time-in-range glucose data, HbA1c results within or close to the reference range of people without diabetes, and with almost no hypo events. Personally I look at Medtronic’s published results and think “so what?” Now of course not everyone will get the same results with each piece of equipment. Other people using the same equipment as me will get different results. I know some people getting lower numbers than I do, but I’m more than happy at the moment with an HbA1c of 5.4% and how little my system intrudes on my life (I’m not on a low-carb diet for example). I know of a lot of people who are new to the (non-Medtronic: Loop, OpenAPS, or AndroidAPS) system and feel that they still want to improve their results, but most of them feel empowered and wanting to improve, and I think most of those people are still only achieving results that the 670G is aiming at (and sometimes reaching). Also keep in mind that some people manage to achieve results similar to my own without using any automatic closed-loop system. But I like not having to dedicate so much of my thought processes to managing my diabetes! I have listed above many criticisms and risks of the 670G loop system. Because they are important. But many people (including some of my friends) do still manage to survive and even thrive with the 670G. A very obvious advantage of the 670G loop system is that it’s a commercial system with commercial (and doctor) support. Many doctors will be more comfortable recommending a commercial system than one supported by the user themselves (and backed up by helpful online communities). 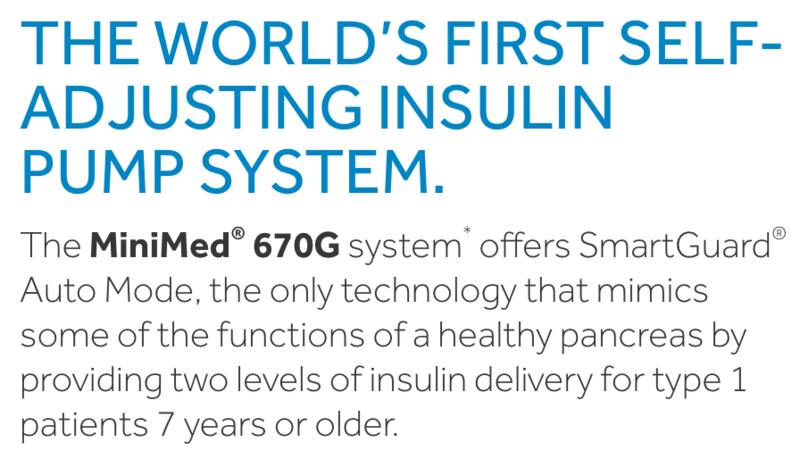 The Medtronic 670G doesn’t need you to carry a device other than the pump: it does everything itself internally. So that can be an advantage to consider. Other systems usually require you to carry at least one other device such as a mobile phone (and sometimes a few extra components such as a RileyLink or “rig”). However this does also mean that by default the system does not connect to the internet and provide the ability to remotely monitor the alarms and system behaviour. Many 670G users decide to set up Nightscout hardware (the same as can be done with the 640G pump) to address this (see the “Nightscout for Medtronic” Facebook group for further information). A good closed-loop system will help keep you in-range through continual adjustments without you having to pay attention, and without intruding on your quality of life. With the launch of the Medtronic 670G it’s great to see another closed-loop system be introduced for people with diabetes: choice is good. I hope people can remain safe with it and achieve the results they’re hoping for. In fact I hope everyone can make reasonably-informed decisions, and are happy with the results of their choice! If you’re interested in the closed-loop systems available in Australia, see my article “Closed-loop pump options” from November 2018. Indeed, another non-configurable (and rather high) target. Not all exercise is the same. It’s always worth bearing in mind that with something like 50% of the T1D population having an Hba1C of 8.0% or higher (and presumably commensurate time in range) and the limited amount of tuning that the 670G (or other commercial systems) require, the benefits for a significant swathe of the population are likely to outweigh the limitations that those of us using DIY systems see in the 670G, accepting, of course, that they can live with the CGM foibles it presents. In South Australia my endocrinologist advises that I must not set out to drive if my BSL is less than 5 mmol/l. This is supposed to take into account the error rate in glucose meter readings to avoid a real BSL of below 4 mmol/l. If I were to use the Medtronic 670 it would have to be in manual mode because in auto it could not be limited to 5 mmol/l. So no advantage of insulin suspend in manual either. Maybe Medtronics have forgotten that some TIDs on other pumps or even mdi can achieve similar or better in range (4 -7.8 mmol/l) results with use of a very low carb diet. Yes, they maybe using CGM continuously or intermittently. But the 10 mmol/l upper in-range reading of Medtronics reeks of the problems with ADA-recommended high carb diet. Do not you just love being dictated to by folks with out-dated concepts??? The Australian guidance suggests that you be “5 before driving” and that you test again within 2 hours. Apart from differences in meter accuracy, this also takes into account that you might not stay above 5 all the time within those 2 hours. If I drop into the 4s while driving I don’t panic (with my own loop running it’s not likely to drop much further). The Medtronic 670G is aiming at 6.7 mmol/l so if it gets anywhere close to that you should be fine to drive. Again I’m surprised, how often an added constant (elevated target bg) is used to compensate for something that gets applied as a factor (insulin sensitivity). Under “normal”, non-resistant conditions, moderate aerob activity more or less doubles insulin sensitivity, giving the currently active Insulin on Board (including basal insulin) some true leverage. This is especially true for everyday activities, including household chores, not limiting the effect to dedicated “exercise”. An elevated target bg just won’t cut it under these circumstances. Unfortunately while the medtronic pump will avoid adding even more insulin into the equation by suspending basal insulin, it will not suggest taking carbs. Changing the target BG is surprisingly effective as a tool in managing exercise though, even if it is just a workaround. How insulin sensitivity changes based on exercise and how to model that in loops is an area more than a few people are looking at, both in the opensource and commercial environments. David, pls can you direct me/us to anything that is written on this. I am just about to start using the 670G and am interest to learn how best to adjust of exercise. Really you need to look to the communities in the US where people have been working out how to exercise with the 670G for some time now. Gary Scheiner usually writes interesting stuff. Here’s his own analysis of using the 670G, which has some comments about exercise. Sorry, didn’t check spelling. Meant … ‘and am interested to learn how best to adjust the 670G for exercise, such as running’. That’s what I translated it to.